Fiat Pur-O2 | What Car? Fiat is showing off its environmental credentials in Paris, with the launch of the annoying-to-type Pur-O2 range of cars. Pur-O2 to Fiat is a little bit like what Econetic is to Ford and Bluemotion is to Volkswagen using a mix of aerodynamic tweaks, low-rolling-resistance tyres, low-viscosity fluids and gearboxes with modified ratios to help reduce a car's carbon dioxide emissions. In addition to these modifications, the Puro-O2 models can have a stop-start system, which automatically cuts off the engine when the car is stationary and fires up again when the clutch is engaged. The first models to get Pur-O2 will be the 500 and the Bravo, but while Europe will start to get these models from November, Britain is likely to have a different strategy. 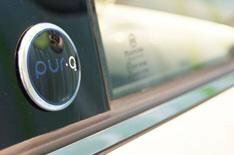 Instead of bringing the Pur-O2 badge over to the UK, Fiat is likely to roll out revisions such as Stop-Start and low-rolling-resistance tyres on selected models from the start of next year. Based on a Lounge model, fitted with the 1.2 petrol engine, the 500 Pur-O2 will emit 115g/km of CO2. There's no word yet on fuel consumption. Fiat says that it is possible to fit the 500 Pur-O2 with its Dualogic clutchless manual gearbox, which will lower emissions further. Pur-O2 versions of the Bravo come with either 90bhp 1.6 diesel or a 105bhp version of the same engine. CO2 emissions are 115g/km and 119g/km respectively. Fiat's Eco Drive is a new application that analyses your driving style then offers advice on how to drive more efficiently. It will be available on all models equipped with Fiat's bluetooth technology Blue& Me. You download your driving characteristics onto a USB stick and can then analyse their fuel consumption and CO2 emissions of each trip they make.